A true-blue athlete from Mumbai, Aadit Zaveri has been steadily improving his Professional Squash Association (PSA) ranking over the past year. The 26-year-old began in competitive sports with swimming and gymnastics and finally settled on squash, ultimately becoming the national championship runner-up at the junior level. He completed schooling at Cathedral and John Connon School before being recruited into one of the best sports boarding schools in the UK – the Millfield School. With his sights set on achieving bigger goals, he’s already an inspiration to many squash enthusiasts. What inspired you to play squash professionally? At what age did you start off? It was the unparalleled feeling of winning. Chasing this feeling is the biggest driving force for me. Winning is indeed exciting at all levels; the higher the level, the greater the feeling of reward. My father was a four-time national swimming champion in the 100-metre butterfly, and the hunger of competition and winning was instilled in me at a very young age. 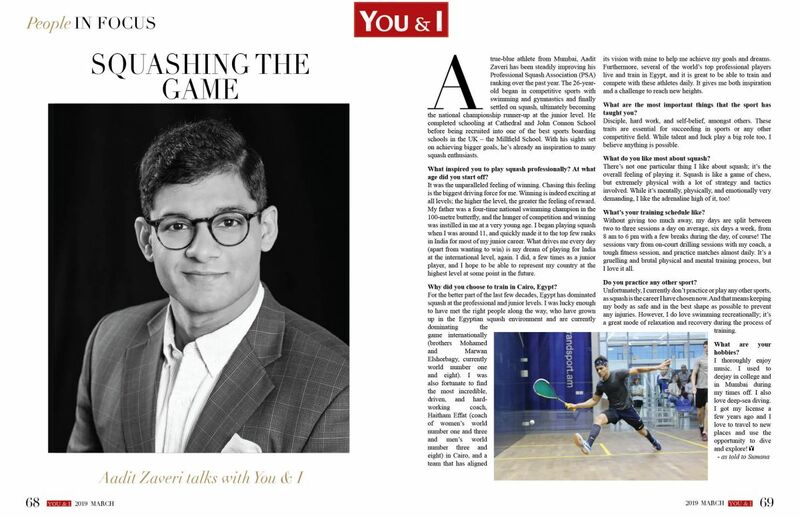 I began playing squash when I was around 11, and quickly made it to the top few ranks in India for most of my junior career. What drives me every day (apart from wanting to win) is my dream of playing for India at the international level, again. I did, a few times as a junior player, and I hope to be able to represent my country at the highest level at some point in the future. Why did you choose to train in Cairo, Egypt? For the better part of the last few decades, Egypt has dominated squash at the professional and junior levels. I was lucky enough to have met the right people along the way, who have grown up in the Egyptian squash environment and are currently dominating the game internationally (brothers Mohamed and Marwan Elshorbagy, currently world number one and eight). I was also fortunate to find the most incredible, driven, and hard-working coach, Haitham Effat (coach of women’s world number one and three and men’s world number three and eight) in Cairo, and a team that has aligned its vision with mine to help me achieve my goals and dreams. Furthermore, several of the world’s top professional players live and train in Egypt, and it is great to be able to train and compete with these athletes daily. It gives me both inspiration and a challenge to reach new heights. What are the most important things that the sport has taught you? Disciple, hard work, and self-belief, amongst others. These traits are essential for succeeding in sports or any other competitive field. While talent and luck play a big role too, I believe anything is possible. What do you like most about squash? There’s not one particular thing I like about squash; it’s the overall feeling of playing it. Squash is like a game of chess, but extremely physical with a lot of strategy and tactics involved. While it’s mentally, physically, and emotionally very demanding, I like the adrenaline high of it, too! Without giving too much away, my days are split between two to three sessions a day on average, six days a week, from 8 am to 6 pm with a few breaks during the day, of course! The sessions vary from on-court drilling sessions with my coach, a tough fitness session, and practice matches almost daily. It’s a gruelling and brutal physical and mental training process, but I love it all. Do you practice any other sport? Unfortunately, I currently don’t practice or play any other sports, as squash is the career I have chosen now. And that means keeping my body as safe and in the best shape as possible to prevent any injuries. However, I do love swimming recreationally; it’s a great mode of relaxation and recovery during the process of training.